Ernest Hemingway’s famous memoir about his time in the French capital contains the line: “If you are lucky enough to have lived in Paris as a young man, then wherever you go for the rest of your life, it stays with you, for Paris is a moveable feast." Although I’m not exactly sure what Hemingway was referring to, I imagine that the city’s stunning vistas and architecture had something to do with it. Being a Francophile snob, wherever I go, I tend to make comparisons to Paris, subconsciously or not. It was probably Woody Allen’s film Manhattan which first allowed me to discover the beauty of New York City. Uncovering architectural gems in the Big Apple may take a bit of searching, but they are definitely there and worth the effort. An interesting website pointed me in the direction of a couple of unforgettable buildings. On our latest trip to the city, I dropped in to the St. Regis Hotel, located at 5th Ave. and 55th Street. Funded by millionaire businessman (and eventual Titanic victim) John Jacob Astor IV, the building was designed by Trowbridge and Livingston in the Second Empire Baroque style developed at the École des Beaux-Arts so popular in early twentieth century American architecture. Named for a lake in the Adirondacks, the eighteen-story building was the tallest hotel in Manhattan when it opened for business in September 1904. 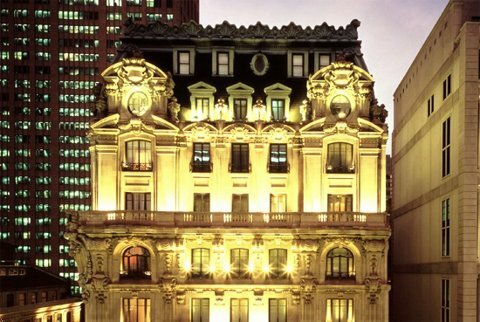 Today the St. Regis is still considered one of the city’s prime hotels; it was designated this year to the Gold List of Condé Nast Traveller’s best places to stay in the state of New York. The very exterior of the building lets you know that you’re in for something special, but the lobby is a model of luxury. With its marble floors, crystal chandeliers, murals on the walls and ceiling, and especially its gold-trimmed reception area, the hotel brings you back to the extravagance of another age. Of course, the cheapo side of me would never allow me to book a room in such a place, but it was a delight to wander through admiring the hotel and taking a look at people who did stay there. Just a few blocks away from the St. Regis between 50th and 51st on 5th Avenue stands the Cathedral of St. Patrick. 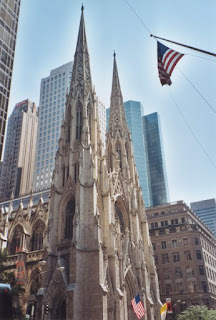 While I’ve visited the well-known church several times in the past, I was especially interested in seeing a Gothic Revival building after posting on medieval French cathedrals a few weeks ago on this blog. 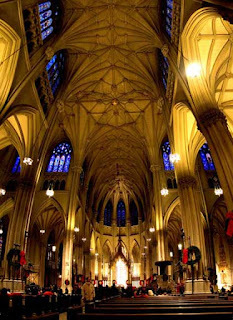 The brain-child of Archbishop John Hughes, the “new St. Patrick’s Cathedral” was to replace the original on Mulberry Street; controversy surrounded the decision to build in a near-wilderness area of the island. Construction began in 1858, but because of the delay caused by the Civil War, the cathedral wasn’t dedicated until 1879. The first thing you notice is the symmetrical beauty of the white marble exterior. Walking in, visitors can’t miss the heavy bronze doors, which celebrate immigrant saints like Isaac Jogues, Frances Cabrini, and the native-born Elizabeth Seton. The brightness of the soaring nave inside is indeed impressive, as are the stained-glass windows and the dozens of side altars that ring the interior. Notable events such as the funerals of Babe Ruth and Robert Kennedy have taken place here. Too bad that tours are not regularly scheduled in the cathedral; it seems that it would be a good way to help subsidize its planned multi-million dollar renovation now going on. So much to see and do in New York; I can't wait for the next visit!